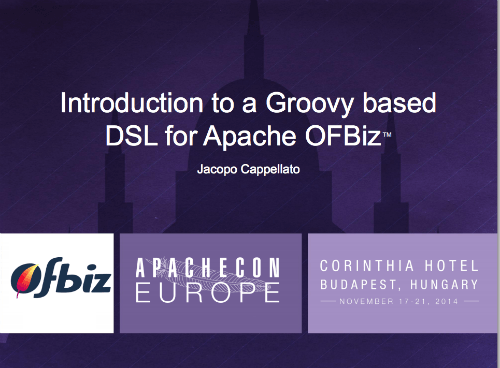 Check out this presentation (and detailed reference page) about Groovy based DSL for Apache OFBiz by HotWax Media V.P. of Technology, Jacopo Cappellato. He recently delivered this information at ApacheCon 2014 in Budapest, Hungary. The OFBiz track at the Apachecon EU 2014 event featured presentations about key aspects of OFBiz: business, development and operations by speakers from various countries within the European market space. Jacopo joined HotWax Media’s Executive Team in 2008. Based in Italy, Jacopo began participating in the Apache Open For Business Project (OFBiz) in 2003 and is now a committer and chairperson of the OFBiz Project Management Committee. Jacopo is also a member of the Apache Software Foundation. Prior to his involvement with HotWax Media, Jacopo participated in several ERP projects for his company, TAU Informatica. He graduated from the University of Padua with a M.S. in Computer Science Engineering. HotWax media is the leading global innovator of flexible enterprise commerce solutions powered by Apache OFBiz. Contact us today to learn more about how to put the power of OFBiz to work for your business.